Before Christmas I promised you a tutorial for using the Vintage Ornament die to make a Calla Lily. This is the die I'm using, from Impression Obsession. It's always fun to find new uses for things! Hope this helps you see your dies in a new way too... even unseasonal ways! Here's a card I made using my die-cut lilies. The Easter stamp is from I.O's latest release. **I'm starting with some written instructions, but in case they're too vague, there is a video at the end of the post that will hopefully clear up any confusion. To begin, use a paintbrush handle or other tapered tool to curl the curved edges of the diecut in on both sides. Turn the diecut over so the edges you just curved over are to the back, and fold both sides in to the middle. Pinch and twist the bottom of the diecut to secure the curves. You can use stickpins or plastic flower centers for a more realistic touch, and hold them together with a spot of glue. (what are these called? I got them here... they're like little plastic stamens...?) You could also use floral tape and wire to add stems. Here's a video for a visual of the steps - it will hopefully make more sense to see it, if my words above don't quite make sense. Send me a link if you make some of these up - I'd love to see! very clever - and pretty! Oh my! How beautiful! Thank you so much for the wonderful tutorial to make this gorgeous card. Thanks for this tutorial. I'm going to give it a try. 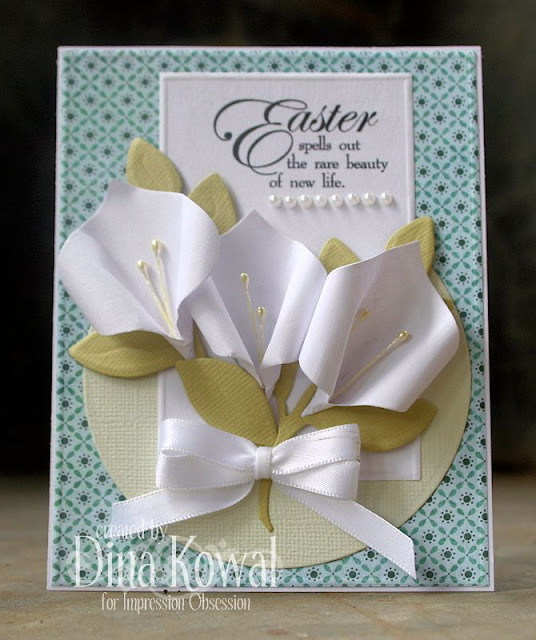 This is gorgeous Dina, I love the printed and the video tutorial, I would have never seen that in the ornament die. You really think outside the box. Thanks for sharing with us. Thanks a bunch for doing the video. Loved the card. And thanks again for sharing. Oh, I'm so glad you posted this.....what a lovely effect....thank you! Now that's clever!! Thanks for the great tutorial, I'll have to give them a go!! Stunning card too! I'm speechless. These lilies are simply beautiful and because of your wonderful tutorial, I think I with limited talent, could actually make them. One thousand thank yous! Well very different no coloring but still a brilliant card and brilliant idea to use a Christmas ball and make it into a lily, no coloring and you'll still the BOMB. Have a fabulous weekend and thanks for doing the video. Amazing Dina!! You captured Mother Nature's essence in paper! Wow Dina, These are beautiful and look like something I could maybe do! How do you come up with these ideas? - That's really thinking outside the box! Dina, this is amazing and thank you for providing us with the tutorial. Just beautiful.